It's a new year! 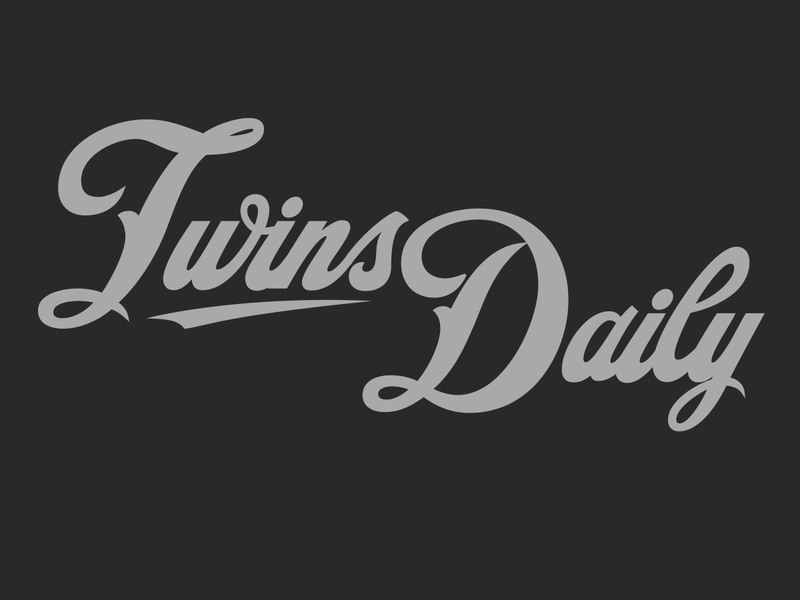 We're heading into 2017, and in a couple of months Twins Daily will celebrate its five-year anniversary. Whether you're a longtime community member or relatively new, we felt this might be a good time to brush up on some of the site's features and functionalities you may not be aware of, or taking full advantage of. When John, Parker, Seth and myself first came together to launch Twins Daily back in March of 2012, we had a number of goals in mind. Sure, we wanted a central place to feature our writing. But more than that, we wanted to build a cohesive community, and an indispensable resource for fans throughout the year. To that end, we implemented a number of features at launch and we've added new ones over time. Today, we'll discuss some of the site's key functionalities that you may or may not be utilizing. Where can you find a full listing of every player in the Twins system, along with prospect profile capsules, details on their method of acquisition and contract, and a whole lot more? Only in our Twins Organization Charts, which enable you to drill down and create custom lists based on a variety of different criteria. View personnel by affiliate, or by position. 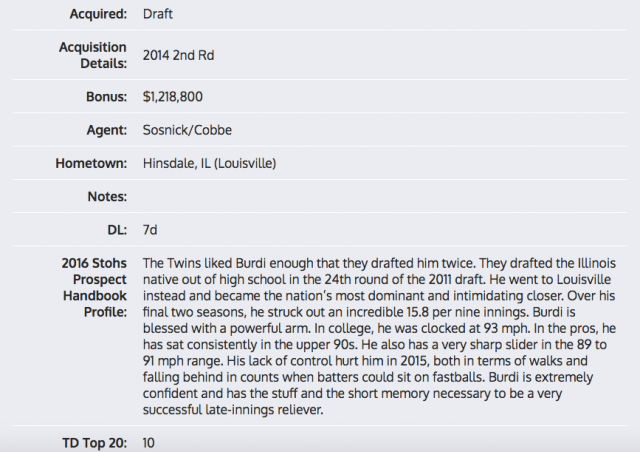 For most minor-leaguers, you can find the most recent write-up from Seth's Prospect Handbook. For big-leaguers, you can on service time, salary details and more. This is one of the most in-depth resources available on the Web for roster geeks so if that's you, make sure to keep it bookmarked. 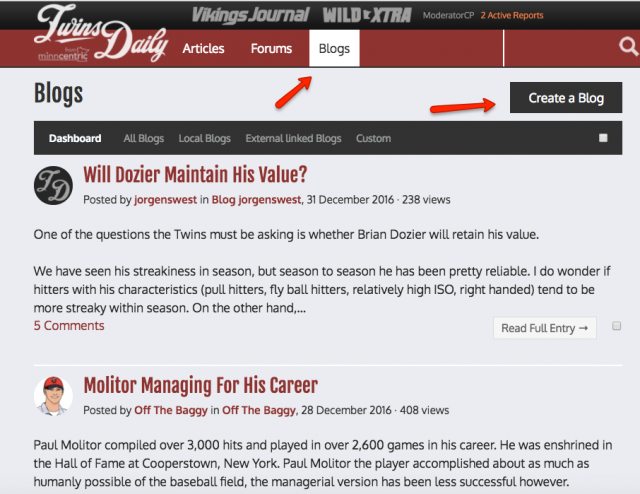 You will always find the Organization Chart on the right section of the top nav bar when you visit Twins Daily. We are taking measures to ensure that this living database remains steadfastly updated all year. Nearby the Organization Chart on the top menu, you will also find the Free Agent Tracker. This is a new feature we just added this offseason, as a component of our ongoing coverage for the Offseason Handbook. Here, you will find a complete list of available big-league free agents. Like with the Org Charts, you can filter by different parameters. When you first enter the tracker, the most recent signings will appear at the top the list, providing an easy way to get caught up on the latest Hot Stove action if you haven't been plugged in. Comparing the actual contracts to the estimations from the Handbook gives you a good idea of how the market is shaping up relative to expectations. From the screenshot above we can pinpoint a couple of very prominent storylines: the relief pitching market is going crazy, and Edwin Encarnacion really had to settle. This is a functionality that has existed at Twins Daily from the outset, but it's certainly one we would like to see more people use. As soon as you create an account here on the site, you automatically get your own blog. All you need to do is click the "Blogs" tab on the top of the site and then the "Create a Blog" button. To some, this may feel intimidating. But it really is quite easy to do, and you will get some additional exposure (as well as formatting freedom) for your takes in comparison to writing comments in the forum. If you ever have a lengthy response in mind to an article on the site, or a topic in the news, then consider putting your thoughts into blog form. You might just like it. Your pieces might also find their way onto the front page, alongside the site's top content. This can get your work in front of thousands of eyeballs. Those who become regular contributors and meet a certain traffic threshold will also enter our compensation program, which we hope to bolster in 2017. Unsurprisingly, the most popular and active sections of the message board are Minnesota Twins Talk and Twins Minor League Talk. But one thing you'll find when interacting with folks here on Twins Daily is that common interests, and thoughtful conversations, tend to expand beyond the scope of the local nine. Check out Other Baseball for discussion of general MLB topics. Or click into The Sports Bar for casual chatter about sports and entertainment. Also, if you ever experience technical issues with the site, or feel some aspect could be improved, your best bet is to start a thread in the Questions About Minncentric subforum. Did you know that could be receiving an email in your inbox with the latest Twins headlines? Our newsletter (delivered 3x per week in-season, 2x per week over the winter) offers a convenient way to stay on top of the big new stories and breaking news. As always, we appreciate your patronage and hope you'll take advantage of Twins Daily and everything it offers. We look forward to a big year in 2017, both for the team and site, and we're excited to have you all along for the ride. I have been a TD follower for a long time and to my chagrin, did not know of some of these features. Thank you Nick, for posting this. I've been a reader since 2012 and I didn't know about some of these features. I really like the newsletter. Receiving it prompts me to visit TD at least 2-3 times per week.